Application software is now specifically designed for real money mobile and tablet casinos. These mobile casinos generally use the same licensing authorities and software providers as their online platforms. Mobile punters can easily and legally enjoy these interactive specific real cash casino apps on phones or tabs via two distinct methods, which we explore in detail below. You can instantly download a casino app by tapping the images above. Each have their own quirks, features and benefits. Often people don’t wish to install application software due to space limitations, the need for updates, and even the concern of bugs and faults. We will only recommend native apps (market apps) which maintain high quality and are secure, but there is nothing wrong with opting for what could be considered a more convenient option – instant play and Web apps. Royal Vegas: The Royal Vegas app is a fully function Microgaming production. It has over 100 real money pokies for mobile players, plus a handful of table games. Most of the deposit options available on desktop are able to be used on mobile, although people wish to do a bank transfer may need to facilitate it from their computer. Note: The official Royal Vegas Casino app is branded Regal Vegas in all app stores for marketing purposes. Operated by the same company, Regal Vegas (the practice play interface) is required to be installed to gain access to the Royal Vegas interface (real money mode). Both interfaces are accessible within this app. Leo Vegas: Leo Vegas Casino’s downloadable casino app has won multiple awards for being the best mobile casino site, so this app makes a great choice if you’re looking for a safe and exciting casino app for play on the go. You’ll find a giant range of mobile casino games available here, including tonnes of online pokies, table games and a selection of live dealer titles. 32Red Casino: A widely respected brand in the online casino industry, 32Red is powered using Microgaming software and offers a lively, user-friendly native casino app with games available for free play and real money bets. New players can get a matched bonus for every real money deposit made. Platinum Play: Is from the same stable (Fortune Lounge) as the Royal vegas app and is basically he same produce with a different skin. As there is not much selection in terms of native casinos apps we have included Platinum Play. To be clear, you can download both apps and claim their respective bonuses and promotions. With limited choices available for downloading casino apps, the better option is to simply play at a download-free casino directly over your mobile Web browser. There are many great mobile casino sites out there so the instant-play option gives you much more choice. Tap any of the below ‘instant play’ buttons, and you are taken to the mobile-compatible casino, directly via your Web-browser. The instant-play mobile casinos allow us to enjoy games via the Internet without the need to install any software. We can then create Web apps via our device’s settings (adding the site/game to our homescreen). These Web apps mimic market apps, but use little (if any) disk space, and are coded in browser language such as Flash, Java and HTML5. 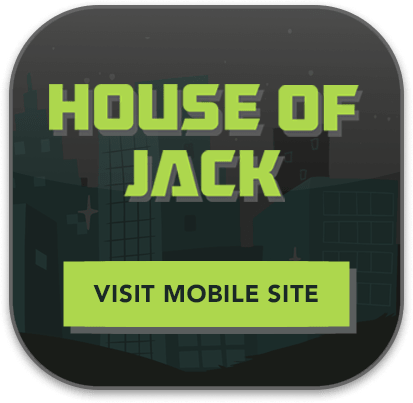 House of Jack: Has a huge selection of mobile games available for play on the go, with a great sign up bonus available for new players. The games are made up from a number of different software providers and include pokies, table games and niche games. Deposit options are plentiful and we strong recommend giving this vibrant casino a try. 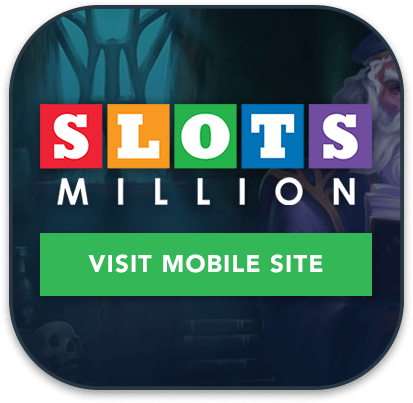 Slots Million: If you’re looking for download-free mobile pokies, Slots Million has you covered, with a huge range of mobile slot games to choose from as well as a great selection of mobile table games and other card and number games. You’ll find mobile games here from all the leading software providers. 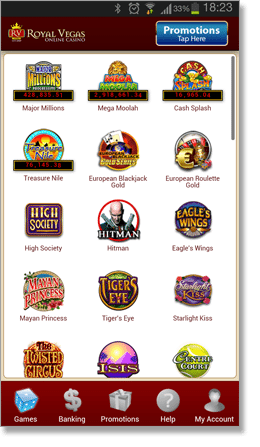 Royal Vegas: Operates much like the casinos native app and is a stripped back version of the desktop site. Features over 100 real money pokies and tables games. The RNG games provided load quickly and seamlessly. New customers can claim up to $1200 in bonus bets. We have listed the major mobile companies and operating systems below, and explain their compatibility with our recommended mobile casinos. 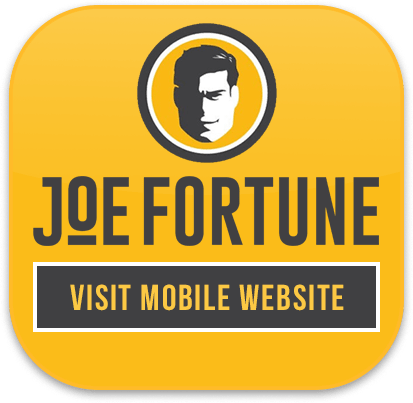 Most casinos only have a mobile website, but there are a select few with downloadable apps for smartphone and tablet. Casino websites are compatible with all types of mobile phone software. Android, an open-license operating system, is owned by Google, and works with other companies like Samsung, Sony, HTC, T-Mobile, Nextel and Texas Instruments. Android mobile casino app users are spoilt for choice with many ‘non-market’ apps supplied by online casinos. What this means is you are downloading the app directly from the casino, not through the Google Play store. To make your phone compatible you will need to run on ‘non-market’ apps in settings. Click any image directly above to visit the mobile site of the respective casino and play real money games such as blackjack on your Android device. iOS is the mobile operating system developed by Apple Inc. and distributed solely for Apple hardware. The iOS runs on all mobile Apple products such as the iPhone, iPad and iPod. For a long time iOS users were unable to download casino apps, but in recent times the Apple App Store has loosened its rules and their a few good options, and also some bad eggs. 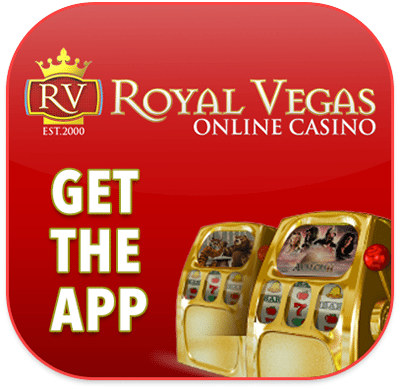 The Royal Vegas application is a great option for iOS users. Or tap any of the pictures under ‘Real money mobile casinos’ to visit safe legal casinos. The BlackBerry, once a vital force in the global cellphone market, today commands only about 3% of the global market. While that might not sound like much, it’s enough of a demand for online casinos to market their mobile software to those who still cherish their distinguished BlackBerries. Microsoft’s Windows Phone OS (the successor to the Windows Mobile operating system), surpassed BlackBerry in total sales in 2013, and it is making major strides in the mobile industry. It aims its product at the consumer market, rather than the enterprise market, and the ‘Modern’ user interface is clean and advanced, making casino games a pleasure to play. Access the official Royal Vegas Blackberry app via BlackBerry World, Windows Phone Store or any other app distributing platform here, or play via the Internet and create your own browser-based apps. How do mobile casinos and their apps work? Many of the sites we recommend use the same gaming software (Microgaming) to power their games, so you’ll find that the layout of their mobile casinos are of a similar nature. Currently, Royal Vegas has its own dedicated mobile application software which can be downloaded on to smartphones and tablets, and has been given individual adjustments, hardware specifications and configurations to suit certain platforms such as Apple, Android, Windows and BlackBerry. The Royal Vegas Casino app acts just like any other downloadable/market app (such as Facebook, Snapchat, etc.). Note: Welcome bonuses and VIP rewards offered by online casinos all remain the same within their mobile platforms as at the full desktop casinos – it is just the layout and range of games which differ. Casino apps can be played via Facebook, but such apps can’t be played for real money – they are for pure free-play entertainment purposes. The United Kingdom however, is somewhat less stringent with its laws concerning interactive gambling, allowing residents to play casino titles for real money via Facebook. Most rules are unlikely to change any-time soon though, in regards to Facebook real cash applications. Read more about playing casino games on Facebook. Online and mobile casinos of the same company are often categorised as two separate platforms, largely due to the increase in popularity of mobile and tablet gaming; so target not only those who enjoy punting on their desktop computers, but a wider audience which enjoys the convenience of on-the-go gambling.